Another item in my wish list in as far as house improvement is concerned is installing paving stones in our garage. I haven't done it so far because, we are still thinking of constructing an additional bedroom on top of our garage and installing paving stones in the driveway should be on the last part of our projects. I don't want to put my money into waste if I would do it now since the construction of an additional bedroom might just cause damage to the paving stones. But since, I am a goal oriented person, advance planning and research is always a must for me. I don't want to fail on any project that I do, so I make sure that everything is carefully studied. 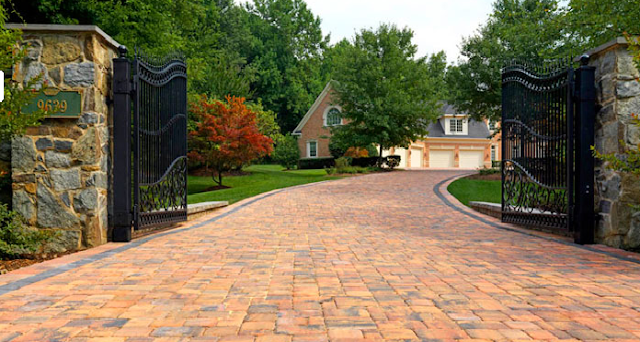 Well, I'd been eyeing for an inspiration and I was just so ecstatic to discover some really gorgeous designs for interlocking brick driveway pavers online. These are available at systempavers.com. There are a variety of designs to choose from and all designs can surely transform your outdoor spaces into something really stunning. Installed by hard scape experts, clients can only be assured of high quality materials and services. I think that apart from adding beauty to your house, installing paving stones also had a number of benefits. You can be assured of a stronger driveway, it can complement the overall design of your house and landscape, easy to install and requires less curing time than concrete, durable, easy to repair as individual paver can be removed and replaced when necessary and best of all, easy to maintain. The so many advantages of having paving stones in our driveways and walkways really convinced me of pushing through with my plan. I am just really excited to choose from so many colors, sizes and designs available. I'm sure that it will transform our garage into something that's really attractive. Love this post, we will be building our dream home this year and I love the paving stones for a driveway! Thanks for sharing! Well done with your wish. The entrance is looking really nice. @Pamela, all the best to you for your dream house. The idea of brick employment is great but concrete slabs can be used for the purpose as they stay cool in summers. If any of the day you find that your home decorating desire is born again, you may include them to your garden as it will definitely feel great in summers and looks aesthetic as well.